The handful of cottage-industry smokehouses found in the far north of the mainland continue to use traditional smoking and curing methods, drawing from the vast harvest Scotland has to offer and attracting visitors and locals alike. Owners tell how the distinct geographical locations of their smokeries add to the unique flavour of their products. While all are fairly small and generally family-run businesses, their product ranges vary widely. Ask nicely, it seems, and they’ll smoke just about whatever you want. Right at the northern tip of the mainland sits Caithness Smokehouse. Proprietors John and Christine Inglis chose to set up next to the major fishing port of Scrabster, ensuring that produce is as fresh and as locally sourced as can be. Simple, traditional methods are used in their large range of smoked products, which include hot- and cold-smoked salmon, hake, haddock, as well as seafood, venison, bacon, goose, cheese – and even butter, eggs and oatmeal for oatcakes. Although they don’t see as many tourists as they used to, John feels the smoking industry is still held in high regard, and reckons ‘people will still pay money for quality goods’. The majority of their produce is delivered to Inverness, with roughly 30 per cent of sales coming via their online ordering facility. Word of mouth has spread their reputation south of the border, and their butter is to be featured on tables at Wimbledon and The Ashes in 2013. Relatively close by is Ullapool Smokehouse, a small business run by Iain Boyd and Andy Reeve. Their popular stall at the town’s Saturday market is supplemented by mail-order sales, and they also supply to a number of local hotels and restaurants. The pair take pride in doing all the work themselves – from smoking and slicing to packing, dispatching and selling – with over 60 years’ experience between them in the salmon, herring and smoking business. Their locally sourced salmon, from Wester Ross Fisheries, is RSPCA certified, and the fish is smoked using traditional methods, including their special ingredient of a malt whisky cure. Keen to stand out from the rest of the pack, this smokehouse also offers maple-cure hot-smoked salmon, sea-grown rainbow trout, kippers and smoked cheese. Over on the east coast of Sutherland, Helmsdale Smokehouse is a family business run by Alexander and Fiona Cowrie. They will smoke any kind of fish caught in the nearby River Helmsdale, as well as crab when it’s in season. Although they now sell only directly to regular customers, they have a good number of these who come back time and time again, and who can even request a particular type of fish to be caught for them and smoked to order. 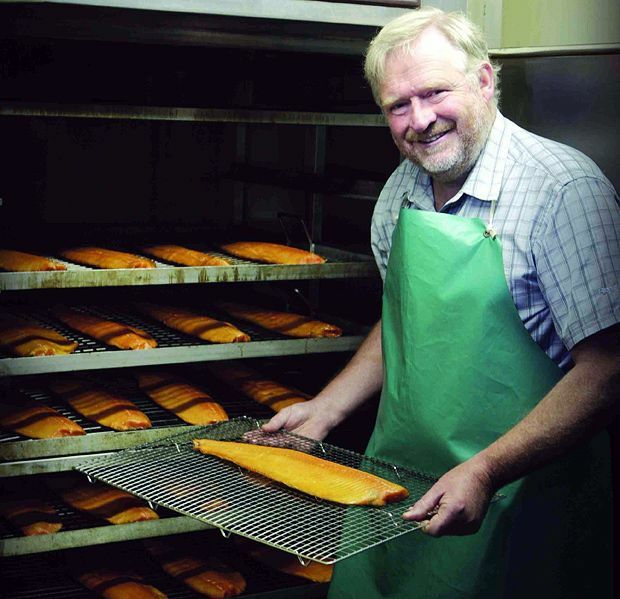 A family smokery run by Alexander and Fiona Cowrie and father Sandy, Helmsdale process fish, including salmon caught in the nearby river Helmsdale, as well as game birds, venison and poultry.